Guide to working with SAML v1.x. ForgeRock Access Management provides authentication, authorization, entitlement and federation software. This guide covers concepts, configuration, and usage procedures for working with Security Assertion Markup Language (SAML) v1.x features provided by ForgeRock Access Management. ForgeRock Access Management supports SAML version 1.0 and 1.1. This guide is written for anyone using ForgeRock Access Management for SAML v1.x identity and service providers. This chapter describes OpenAM's support for the SAML v1.x framework for exchanging security data. See the following for more information: SAML v2.0 Guide, OAuth 2.0 Guide, and Chapter 1, "Introducing OpenID Connect 1.0" in the OpenID Connect 1.0 Guide. 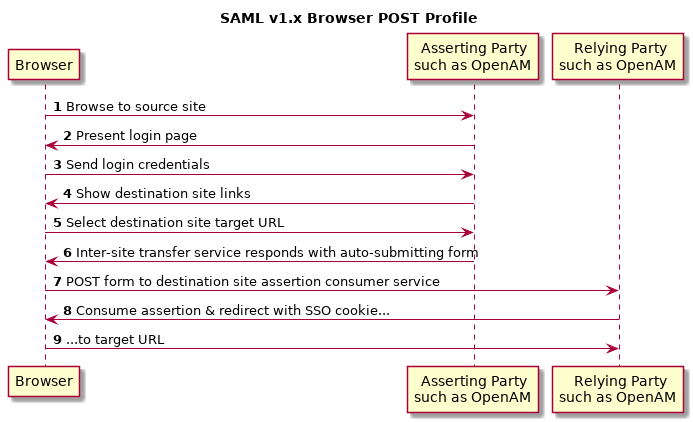 OpenAM's support for SAML 1.x requires stateful sessions. Be sure that OpenAM is configured for stateful sessions—the default configuration—before attempting to use SAML 1.x functionality in OpenAM. The Assertion Consumer Service at the relying party validates the digital signature on the SAML response, and redirects the browser to the target URL of the resource that the user is attempting to access. The server providing that resource uses the relying party's authorization decision capabilities to establish whether the user can access the resource. If so, the resource is returned to the user's browser. If the relying party is using OpenAM, for example, then the relying party sets an OpenAM SSO token based on the SAML response, and this token is used to track the user's session for authorization. Organizations working together to achieve SAML v1.x web SSO are called trusted partners in this context. Trusted partners agree on which services they provide, which web SSO profiles they implement, and how information is exchanged in the assertions, including profile attribute values. Once the trusted partners have reached agreement on how they interact, you can collect information about your partners' configurations and configure OpenAM to match your organization's part of the agreement. • Section 2.1, "Gathering Configuration Information"
• Section 2.2, "Preparing To Secure SAML v1.x Communications"
• Section 2.3, "Configuring SAML v1.x For Your Site"
• Section 2.4, "Configuring SAML v1.x Trusted Partners"
• Section 2.5, "Testing SAML v1.x Web SSO"
Before you can configure OpenAM to allow web SSO with trusted partners, you must first gather information about the agreement itself, as well as information for your site and for your partners sites. For more information about your own public key certificates, see Section 2.2, "Preparing To Secure SAML v1.x Communications". Trusted partners should ask you for a Site ID. OpenAM generates a SAML v1.x Site ID value at configuration time. This Site ID value corresponds to the server. To find this in the AM console, see Federation > SAML 1.x Configuration > Local Site Properties > Site Identifiers, and then click your server URL. If you have multiple servers in an OpenAM site set up behind a load balancer, you can generate a Site ID, and then use it for all the servers in your site. See Chapter 5, "Setting Up Keys and Keystores" in the Setup and Maintenance Guide for instructions on handling your own key pairs. For specific instructions on changing signing keys, see Procedure 5.3, "To Change Default test Signing Key" in the Setup and Maintenance Guide. Import public key certificates shared by trusted partners into your OpenAM keystore. When you enter SAML v1.x configuration data, The AM console escapes these special characters by default: & < > " ' /. If you have already escaped these characters in the data that you plan to enter in the AM console, set the value of the com.sun.identity.saml.escapeattributevalue property to false under Configure > Server Defaults > Advanced, and then restart OpenAM or the container in which it runs to prevent The AM console from escaping the characters for you. Procedure 2.3, "To Configure Asserting Party Local Site Properties"
Procedure 2.4, "To Configure Relying Party Local Site Properties"
If instead of the default server Site Identifier, you use a Site Identifier for the OpenAM Site, click New in the Site Identifiers table, and then add the information for the OpenAM Site, including the Site ID that you generated. By default OpenAM signs messages using the certificate with alias test. In the NameID Format section, map SAML NameID formats to local OpenAM user profile attributes. This allows OpenAM to map a remote user to a local user profile. In the Attribute Map section, if the parties exchange attributes, then map the SAML attributes requested by relying parties to local OpenAM user profile attributes. This allows OpenAM to map a remote user to a local user profile when not all the partners are using OpenAM user IDs. Procedure 2.5, "To Configure a Trusted Relying Party"
Procedure 2.6, "To Configure a Trusted Asserting Party"
You must also set one or more values in the host list for the partner to identify all hosts from the partner site that can send requests. OpenAM rejects SAML requests from hosts not specified in this list. If the relying party signs requests, then either requests include the certificate for the signing key in the KeyInfo element, or OpenAM must find the signing certificate elsewhere. If the relying party provides the signing certificate separately, import the signing certificate into OpenAM's default keystore file, and set the alias for the signing certificate here in the configuration. For more information about OpenAM's default keystore, see Chapter 5, "Setting Up Keys and Keystores" in the Setup and Maintenance Guide. Optionally set a custom account mapper. By default OpenAM maps accounts based on the NameID format configuration for your site. If the asserting party signs assertions (or other messages) and you have imported the signing certificate into OpenAM's keystore (also used as a trust store), then enter the signing certificate alias. If instead the asserting party includes the signing certificate in the KeyInfo element of signed messages, then you can leave the alias blank. Basic means HTTP Basic authentication (with username and password). For HTTP Basic authentication, the authentication at this level is performed by the application server container, not OpenAM. Therefore if the asserting party runs OpenAM and wants to enforce HTTP Basic authentication, the asserting party administrator must set up the container to handle HTTP Basic authentication for the SOAP URL. • Procedure 2.7, "To Prepare the Servers"
• Procedure 2.8, "To Prepare to Test the Asserting Party"
• Procedure 2.9, "To Prepare to Test the Relying Party"
• Procedure 2.10, "To Try SAML v1.x Web SSO"
You can, for example, set up two separate OpenAM servers on a single host by adding aliases for the hosts in your hosts file, and by using separate containers that listen on different ports. Deploy and configure OpenAM server with the default configuration at http://ap.example.net:8080/ap for the asserting party and at http://rp.example.com:9080/rp for the relying party. This allows you to use the default configuration for both servers. The procedures in this section use those example URLs to represent the OpenAM servers acting as asserting and relying parties. Simulate the OpenAM administrator browsing the asserting party's site, and selecting a link to the AM console on the relying party's site. OpenAM requires that you authenticate. Login as OpenAM demo user, demo with default password changeit, on the asserting party server. Login as OpenAM administrator, amadmin, on the asserting party server.